The first screenshot shows our closest station as the crow flies. 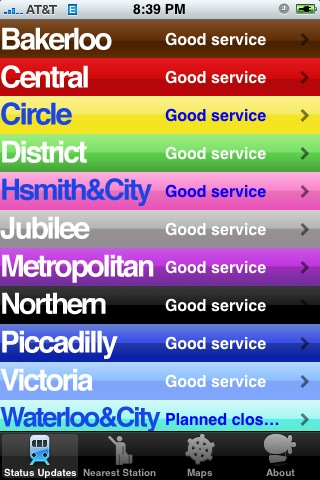 A Londoner might find this feature useful, especially when deciding between several nearby stations. For us, it’s just a little frustrating, as it’s several thousand miles away at the moment. 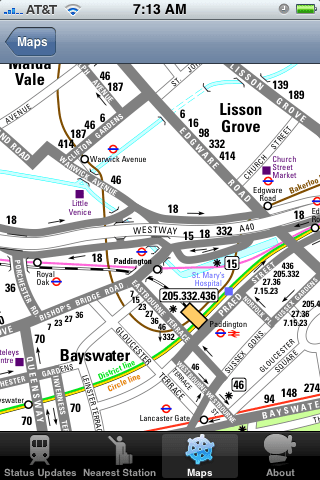 The next screenshot is a close-up of the London Bus map, which shows plenty of detail as to routes and gives an idea of where to catch one of the big red buses. The other maps are the standard rote map and a handy tourist version that shows major attractions and points of interest. Quite handy, if the garden variety tourist can get access, perhaps via wi-fi if not full-on cell service via some sort of “jailbreak” measure. The next shot shows the loading screen with all the pretty colors. 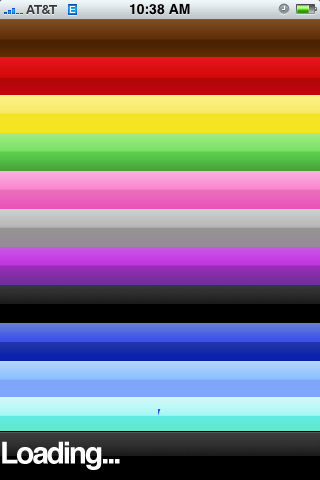 Basically, after it loads, all the line names come up on the appropriate line colors with service updates, or “Good Service” if no problems are reported. And that’s about it. 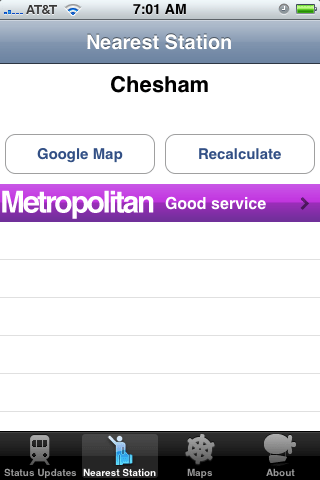 No route planner, no schematics of large stations showing exits, services, or accesibility options. This is a paid app and some reviews mentioned a free one, which will be reviewed later. It looks pretty, and all the stations appear on one screen if all you need is the status of your chosen line. It costs 0.99USD – about 50 new pence, or half a quid if I’ve got my Britspeak right. Pretty good, but there are a couple more applications to check. This entry was posted in The Road Goes Ever On: 3 Weeks in Britain and tagged iPhone, London, Mind the gap by ginny. Bookmark the permalink. Horsies and squirrels and Bears, oh my!